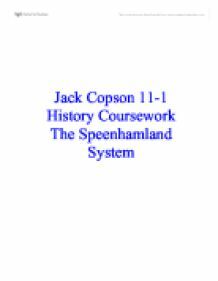 Jack Copson 11-1 History Coursework The Speenhamland System Objective 1 How did the Speenhamland System work? Throughout the 1790's food prices in Britain were a constant problem. During this period Britain was at war with France. This affected trade with mainland Europe and led to rising food prices. Workers wages were seldom enough to keep up with the rising food prices affecting the country. Knowing what had happened during the French revolution in 1798 local parishes and the government realised that if people could no longer afford basic foods such as bread, there could be a large-scale problem. The people could become desperate and cause difficulties for the authorities of Britain. A system was developed in Speen in Berkshire during 1795 that would allow casual workers to provide food for them and their families. 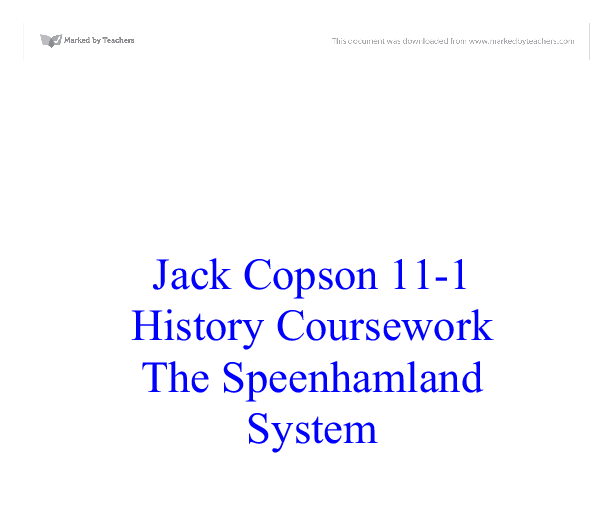 The system became known as the Speenhamland System. The system worked by topping up workers earnings to comply with the current bread prices. If bread prices were to rise, the workers wage would be topped up to enable them to purchase food. The system also worked by the size of each family, more children resulted in more money for workers. This new system only gave workers enough money to top up their earnings in order for them to be able to buy food, but they would only be made up to a subsistence level by their parish. How did the Speenhamland System affect those who were in full-time employment? ...read more. It was the easier option. After noting the above points, I believe that the reasons given for change in the Poor Law are all important. A single point would be insufficient to tip the balance for change. Rising costs of poor relief were seen as a problem because of the way workers who could receive money for not working could easily abuse it. This abuse obviously made the cost of the system rise. Many people living in the countryside were being classed as poor, they flocked to the nearest towns and cities. These people were not looking for work, but only for the money they could receive from the Poor Law system. When more people claimed for poor relief it sends the costs up. This easily links the first two points together, both resulted in a rising cost of poor relief. Using only these two points the new system would have to have a set of rules to determine who is eligible for poor relief and who is not. The size of families also increased the simple philosophy that is you had a larger family then you would receive more money form the Poor Law was used by workers. People had more children in order to claim more money, although the money they received would only just cover the food costs for a larger family. If there were to be a new system it would have to recognise who really depended on the system and who was only abusing it. ...read more. Doctor Nayel said; "Cleanliness and good order cannot be exceeded" He also said; "Healthy appearance of men, women and children" The conditions may have deteriorated after the report. The scandal then broke out. Source D is a pauper describing the living conditions inside Andover workhouse. This is only one mans opinion and he may have been asked leading questions in order to get the answers the questioners wanted. For example, about having to eat raw flesh off of animal bones in the bone house; "Sometimes I have had one that was stale and stinking". A whole investigation cannot be based entirely on one mans opinion on workhouses. This man said that they were fed, but it wasn't enough for a man; "A pint and a half of gruel is not much for a man's breakfast" Personally I believe that source C portrays the conditions which were in operation when Dr. Nayle visited Andover. Obviously for the scandal to break out it must have taken a large deteriation of standards. Source D however, is the opinion of an inmate of the workhouse. He would have realised these conditions every day, and although he may have been asked leading questions, his testimony is more reliable. I believe that source D is more reliable than source C. 4) Source C is taken from a report given by Doctor L.T Nayle, it was likely that he was invited to view the conditions at th Andover Workhouse. The opinion was written before the Andover Scandal of 1845/46. The source only gives an opinion about the conditions at Andover itself, not those of the scandal. ...read more. In the theory last year I covered topics such as Data, Information Systems, Relational Databases, Software and System Development life cycles, which are very relevant to the coursework. Last year I achieved 82/90 in my first exam and 90/90 in my second, so I feel confident that I know these topics well and am ready to apply this knowledge confidently. Staff within in the company who have very little computer knowledge and are used to doing tasks the old way (with pen and paper) might become demotivated. Possible Alternatives I am going to suggest possible alternatives for the design of the new system I.e. > Locating details in the filing cabinet requires the searcher looking through loads of files to find the appropriate information. As it is paper based it can be damaged very easily - it is very fragile. Why computerisation will benefit the business? The date of rental must be the same date as today. Test 8- Deleting members: Input- Click on members then clicks on the delete button. A dialogue box appears to confirm the action, then click OK. Actual output- The member with Member ID 3 was deleted. What happens when a new pupil joins? There is an application form they must fill out that collects all the information about the person, they must also fill out an emergency contact card, and inform us of any medical conditions. How do you notify pupils of a venue change?